MAJOR THESIS. Comic artist Eddie Campbell’s latest book — elaborately titled inside as, THE GOAT GETTERS: A new angle on the beginnings of comics casting a bright spotlight on THE FIGHT OF THE CENTURY. And Reserving a Few Mellow Sidelights for The San Francisco Graft Trials, Harry Thaw’s Murderous Crime Of Passion, The Story of the Lemon. ARTISTS: JIMMY SWINNERTON!! TAD DORGAN!! ROBERT EDGREN!! BUD FISHER!! RUBE GOLDBERG!! GEORGE HERRIMAN!! 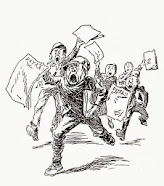 written and designed by Eddie Campbell — is not yet available but already causing some conversation over its major thesis; that the early sporting cartoon, as practiced by men like Tad Dorgan, George Herriman and Rube Goldberg, is the “missing link” in histories detailing the origin of the daily black & white newspaper comic strip. BIRTHPLACE SAN FRANCISCO. The Amazon blurb (where the reader can sample a chapter or two) in similar fashion presents the book as “a new take on the origin of the comic strip,” while Eddie Campbell claims that the sporting page was the venue for the invention of the daily comic strip, and that San Francisco was its birthplace. 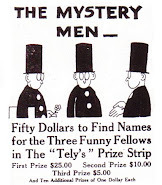 Is it a coincidence that the best of these cartoonists, Tad Dorgan, George Herriman, Rube Goldberg, and Milt Gross (once Tad’s office-boy) carried their slang-heavy verbal and artistic slapstick into the most successful of the daily newspaper comic strips? I think not — and each and all of them drew their verbal inspiration from Tad Dorgan. SPORTING LANGUAGE. Critics like myself do not have to agree with Campbell’s conclusions to enjoy this splendid book, a sprawling epic which aims and succeeds in providing “a reconstruction of the whole picture,” with a focus on boxing, counting the days when the sporting pages — modeled on the British sporting newspapers like Pierce Egan’s Life in London and Sporting Guide (1824) and Bell’s Life in London (1827) — gave several sporting cartoonists ample column space to experiment with vivid language and pictures. The language was the language of the sporting underworld; rich in slang, celebrating the gambler, the pug, the bum, the gangster, and the rube. This was during a period when boxing was illegal in most states and fights were staged on barges, in farmer’s fields, and in sweltering boomtowns in the desert. Ears were torn, eyes were gouged, and tons of blood were spilled. Most of the sporting cartoonists of this era (approximately 1894-1913) not only celebrated this preoccupation with the lag’s life — they lived it. To them it was the most significant and fondly remembered time of their lives. FIRST TIME. 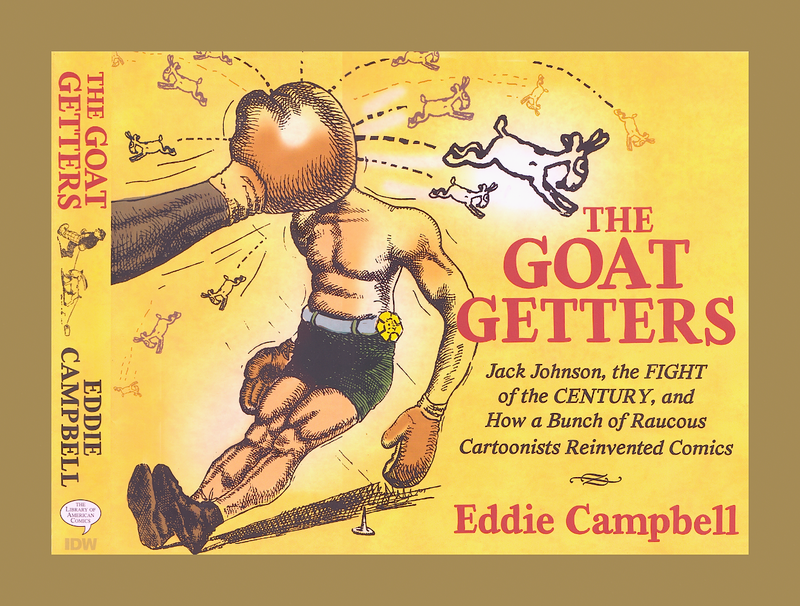 The Goat Getters is the first time an author has attempted to chronicle the entire early days of the sporting cartoon and my hat is off to Eddie Campbell for his superb work in hunting down, cleaning up, and collecting together over 500 illustrations from those far off golden days. Campbell is a marvelous writer too. He brings the natural insight of a cartoonist and a humorist to his observations. Among the many artists covered are Homer Davenport, Jimmy Swinnerton, Tad Dorgan, Robert Edgren, Bud Fisher, Harry Warren, Rube Goldberg, George Herriman, Kate Carew, Fay King, Clare Briggs, Harry Hershfield, A.D. Condo, Nell Brinkley, Dan Leno, Hype Igoe, Robert Ripley, Sid Smith, Pete Llanuza, and a large number of other comickers both famed and forgotten. 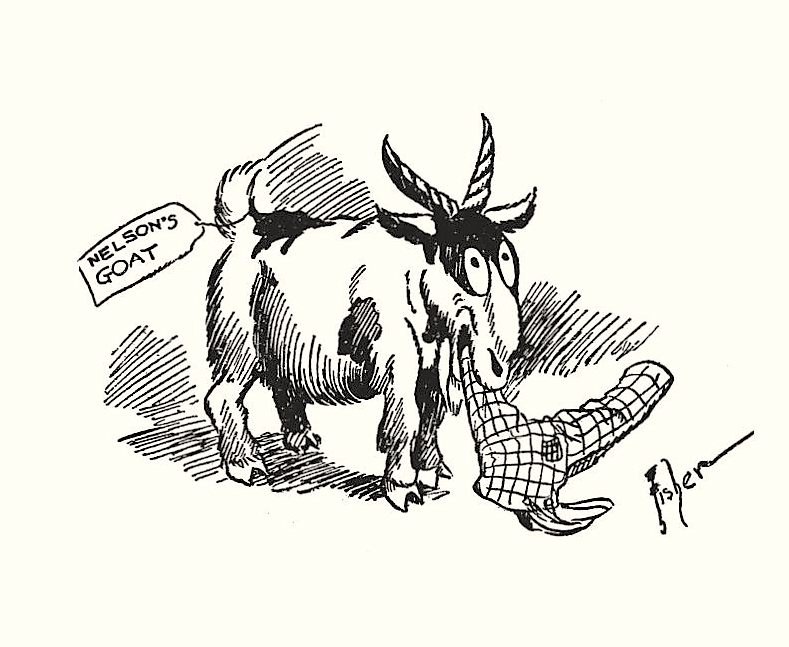 And oh yes, there are goats, plenty of goats — fifty on the last 4 pages alone.